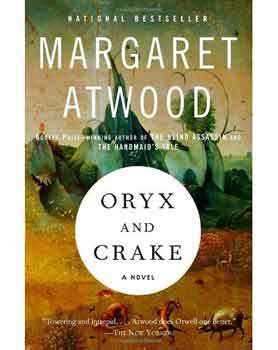 Margret Atwood’s Oryx and Crake is a sad and imaginative near-future sci-fi about the downfall of humanity and those who bring it about. I love stories where the reader goes in completely blind, and gradually more and more is revealed until an entirely unpredictable turn of events leads to the scene of page one. The story is narrated by someone name Snowman, a pathetic lone human survivor of a manmadeÂ apocalypse. He shares what’s left of the world with the Â strange humanoid creatures he calls “crakers” who were somehow created by his once friend Crake. Snowman recalls the events that lead to the downfall of humanity during his years of personal development as a teenager in the age of global warming.Â Atwood’s real strength is creating a range of totally believable characters. Good stuff.